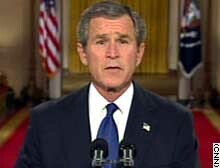 President Bush addresses the nation on Monday night. The regime has a history of reckless aggression in the Middle East. It has a deep hatred of America and our friends and it has aided, trained and harbored terrorists, including operatives of Al Qaeda. The danger is clear: Using chemical, biological or, one day, nuclear weapons obtained with the help of Iraq, the terrorists could fulfill their stated ambitions and kill thousands or hundreds of thousands of innocent people in our country or any other. The United States of America has the sovereign authority to use force in assuring its own national security. That duty falls to me as commander of chief by the oath I have sworn, by the oath I will keep. Recognizing the threat to our country, the United States Congress voted overwhelmingly last year to support the use of force against Iraq. In the case of Iraq, the Security Council did act in the early 1990s. Under Resolutions 678 and 687, both still in effect, the United States and our allies are authorized to use force in ridding Iraq of weapons of mass destruction. This is not a question of authority, it is a question of will. For the last four and a half months, the United States and our allies have worked within the Security Council to enforce that council's longstanding demands. Yet some permanent members of the Security Council have publicly announced that they will veto any resolution that compels the disarmament of Iraq. These governments share our assessment of the danger, but not our resolve to meet it. The United Nations Security Council has not lived up to its responsibilities, so we will rise to ours. In recent days, some governments in the Middle East have been doing their part. They have delivered public and private messages urging the dictator to leave Iraq so that disarmament can proceed peacefully. As our coalition takes away their power, we will deliver the food and medicine you need. We will tear down the apparatus of terror and we will help you to build a new Iraq that is prosperous and free. It is too late for Saddam Hussein to remain in power. It is not too late for the Iraq military to act with honor and protect your country, by permitting the peaceful entry of coalition forces to eliminate weapons of mass destruction. Our forces will give Iraqi military units clear instructions on actions they can take to avoid being attack and destroyed. And all Iraqi military and civilian personnel should listen carefully to this warning: In any conflict, your fate will depend on your actions. Do not destroy oil wells, a source of wealth that belongs to the Iraqi people. Do not obey any command to use weapons of mass destruction against anyone, including the Iraqi people. War crimes will be prosecuted, war criminals will be punished and it will be no defense to say, "I was just following orders." Should Saddam Hussein choose confrontation, the American people can know that every measure has been taken to avoid war and every measure will be taken to win it. And this very fact underscores the reason we cannot live under the threat of blackmail. The terrorist threat to America and the world will be diminished the moment that Saddam Hussein is disarmed. Our government is on heightened watch against these dangers. Just as we are preparing to ensure victory in Iraq, we are taking further actions to protect our homeland. We are now acting because the risks of inaction would be far greater. In one year, or five years, the power of Iraq to inflict harm on all free nations would be multiplied many times over. With these capabilities, Saddam Hussein and his terrorist allies could choose the moment of deadly conflict when they are strongest. We choose to meet that threat now where it arises, before it can appear suddenly in our skies and cities. And responding to such enemies only after they have struck first is not self defense. It is suicide. The security of the world requires disarming Saddam Hussein now. As we enforce the just demands of the world, we will also honor the deepest commitments of our country. Unlike Saddam Hussein, we believe the Iraqi people are deserving and capable of human liberty, and when the dictator has departed, they can set an example to all the Middle East of a vital and peaceful and self-governing nation.